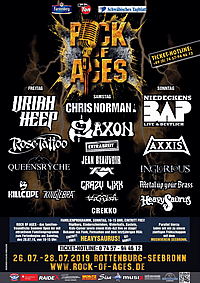 Often described by its visitors as a modern Woodstock for lovers of rock music in all its varieties, the ROCK OF AGES festival was established in 2006. The very first edition featured turned out to be an instant success: artists like like URIAH HEEP, WISHBONE ASH, former MARILLION vocqalist FISH, THE SWEET, GOTTHARD and the two main acts TWISTED SISTER and SAGA delivered stunning performances and gathered a crowd of approx. 6000 visitors during the two day event. A perfect beginning, and so the story continued: In 2007, the stylistic spectrum was boradened a bit and the line up included German rock veterans BAP, the PINK FLOYD tribute show by THE MACHINE and acts like MANFRED MANN'S EARTH BAND, BARCLAY JAMES HARVEST feat. LES HOLROYD, MAGNUM, KROKUS or PINK CREAM 69. 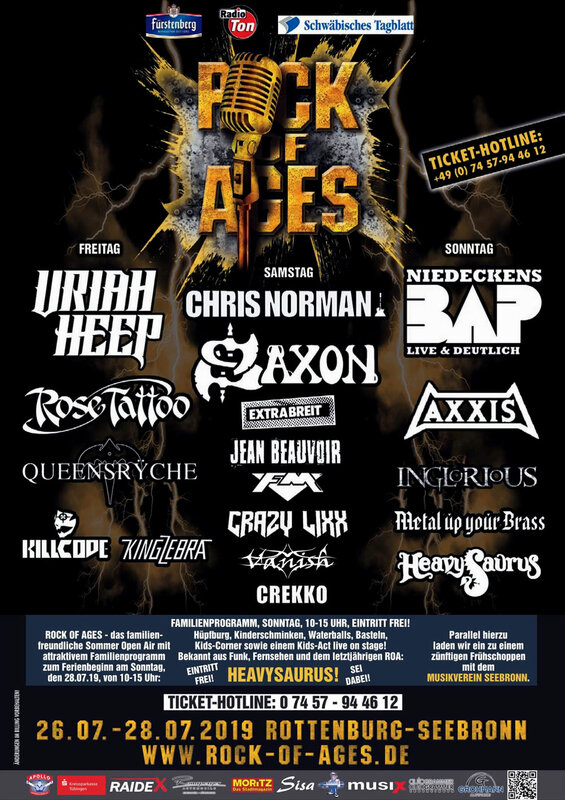 There was no stopping now, and from 2008 to 2014, many a legend stopped by to appear at Seebronn, amongst them GARY MOORE, ALICE COOPER, FOREIGNER, STATUS QUO, JETHRO TULL, KANSAS, THE ALAN PARSONS LIVE PROJECT, EUROPE, THE BOSSHOSS, BOB GELDOF, AVANTASIA, LORDI, SLADE, SUZI QUATRO, GOLDEN EARRING, THE HOOTERS. THE ORCHESTRA, IN EXTREMO, 10CC, MOTHER'S FINEST, ROGER CHAPMAN and ERIC BURDON & THE ANIMALS. In 2015, a very special anniversary edition was set to take place: For the very first time, the programme was enhanced by a third festival day and lasted on from Friday to Sunday. Always a family friendly event offering free access for young children and reduced fares for visitors between 11 and 14, the ROCK OF AGES proved to be not your average rock festival: On Sunday midmorning, everyone was invited to witness popular German children songwriter Detlev Jöcker to entertain all young visitors, while attractions like Funballs, Bungee trampolines, a bouncy castle or face painting were part of each event's day supporting programme. The regular show schedule started in the afternoon. Due to the overwhelming response, it was decided to stick to the new concept. Therefore, ROCK OF AGES 2016 will once more include three days packed with superb rock performances and lots of attractions for all ages.